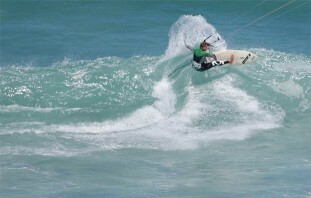 This is the second post in a series of essential topics aimed at novice kitesurfers, check out our first post on getting to know your bar. 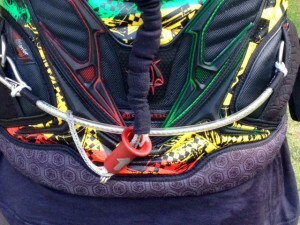 A kite leash is a simple yet vital piece of your kiting equipment. 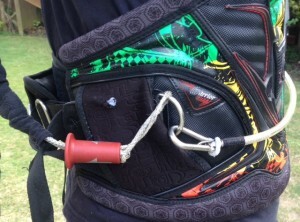 Once you have pulled your primary safety, the leash is the last connection between you and the kite and releasing it will ditch the kite completely. Fortunately, many of us will never have to pull our final release but if you are ever in a situation where you need to – do you think you could? 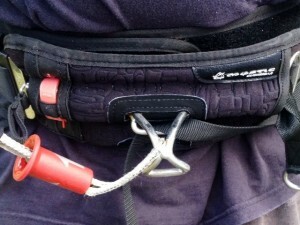 This is where most people tend to clip their safety leash, as manufacturers tend to put an attachment point on the back. 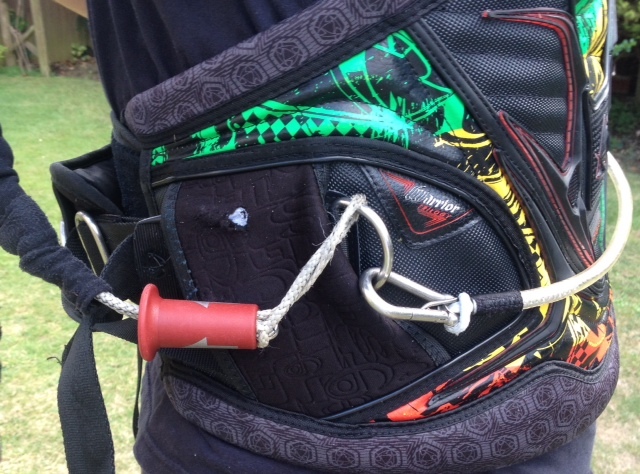 However if you are ever in a situation you are being dragged by the leash you could have very little chance of being able to release it – either it will be directly behind you which is difficult to reach or it can slip to either side, requiring you to think about which side to reach for – harder than you think in the split second you have to react. 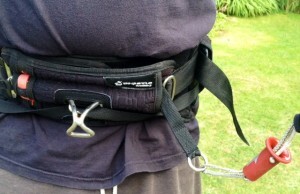 Until a few months back this was my preferred area to attach the leash – it’s out-of-the-way but still reachable & you know to always go for your right-hand side. 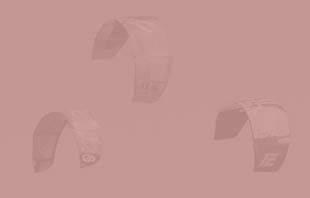 However as it sits slightly behind you, again it is not always the easiest place to reach or see. For advanced riders who hook in on a suicide system there is an another negative. 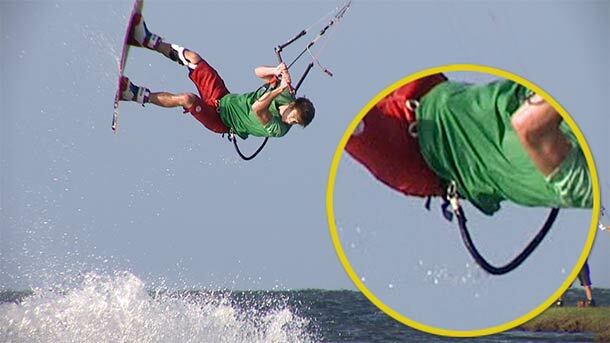 If you miss the bar during an air pass or simply let go, you are pulled from the side and end up facing away from the kite, making the chance of saving a trick and riding away, slightly harder. 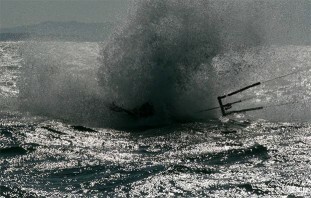 One major issue with attaching the leash to the spreader bar is that if you are ever in a situation where you are being dragged through sand or stones, on your front, it is impossible to reach as your lying on top of the release! Using an extra piece of equipment that came with my leash I have now managed to set up a front facing attachment point, one you can clearly see without a double jointed neck! It is still clear of my spreader bar, so I can easily unhook if I need to pass but it’s far enough to the side that if I do get dragged on my front I’ll be able to get my hand to my leash. So on your next session think about where you place your leash as it could save you time in the water or worse case be a life saver! 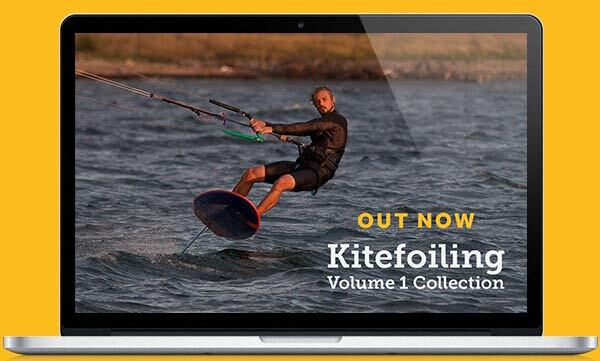 Advanced riders looking to try unhooked tricks can get started with our Unhooking – Setup and Basics video, part of the Kiteboarding Advanced Collection/DVD.